In order to help you avoid paying out a fortune on useless products, I will write a number of blogs about ingredients which have demonstrated rejuvenating properties. And I will begin with the most widely researched ingredient: vitamin A. What does vitamin A actually do? Vitamin A acid, which is only available on prescription, is undeniably skin rejuvenating. The ingredient improves the skin’s structure; wrinkles as a result of sun damage are reduced in depth and amount. The substance specifically stimulates healthy cell division and production of collagen and elastin. What’s more, MMPs (enzymes which break down collagen and elastin) are inhibited. It is highly probable that vitamin A acid also increases the lifespan of fibroblasts. As if that isn’t enough, annoying pigmentation spots can become less visible. A drawback of the medicinal form of vitamin A acid is that it can seriously irritate the skin. But in the last few years the effects of variations of the vitamin have become more apparent. As a guide, I have put the most familiar ones together. 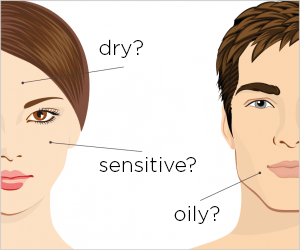 What do these substances do for your skin and how much should your product contain? This, in my view, is the least effective form of vitamin A. This ingredient needs to be converted three times by the skin before it can do its work. And roughly speaking: the more it needs to be converted, the less effective a substance is. Retinyl palmitate is furthermore extremely sensitive to sunlight. The influence of sunlight not only rapidly reduces the efficacy, there may also be damaging free radicals present in the skin. If you have a product containing retinyl palmitate then apply it at night. 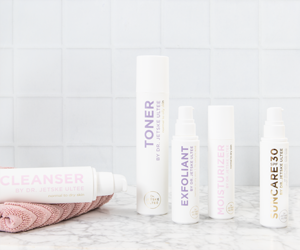 Despite these drawbacks, many manufacturers ultimately choose the ingredient because this variation is more resistant to heat than, for example, the more familiar retinol. Nevertheless, the stability is limited; in studies carried out the shelf life varies up to a maximum of 6 months from production. If you want to use this ingredient, then choose a product which also contains antioxidants. And remember: the less water in the product, the better. An airtight container is, of course, also a must. The more thorough studies whereby a rejuvenating effect was shown, used concentrations of around 1%. However, in Europe, a concentration of 0.3% is advised for facial products, and it won’t be long before higher is also no longer permitted. The skin has to convert this form of vitamin A 3 times as well. Yet it seems to be a better choice than retinyl palmitate because this ingredient penetrates the skin more readily. That is probably linked to the size of the molecule. It is possibly a good option for the sensitive skin which doesn’t tolerate the other derivatives of vitamin A acid. The research into the effectiveness of this ingredient is, however, negligible. The only independent human research dates back to 1998, and showed no significant effect on wrinkles; but did on acne. Retinol can rejuvenate the skin. Of all the forms of vitamin A which are allowed to be used in cosmetics, retinol is the most widely researched. 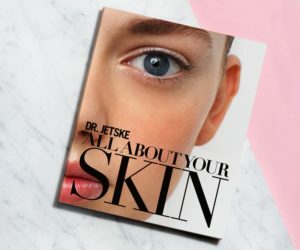 The catch here, though, is that the well conducted studies are carried out using ‘fresh’ retinol in concentrations of 0.4% – 1% or higher (it is around ten to twenty times less effective than tretinoin). And as with retinyl palmitate, an upper limit of 0.3% applies in the Netherlands for facial products. Additionally, the probability that retinol is still effective after it has been stored in your bathroom is not very high. This form of vitamin A only has an effect on your skin if used before it has oxidised; and that is rapid. It not only happens through light and air, but also sun, water and even the oxidation of oils. Therefore don’t use retinol during the day. 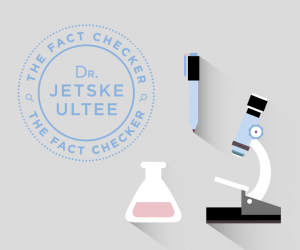 In fact you’re most likely to see results if retinol is encapsulated. If it contains more oil than water, and extra antioxidants have been added, the ingredient may last for a couple of months longer – if kept cool and well packaged. You can never have a very high concentration of encapsulated retinol in your product though. If it states on the packaging, ‘contains 1% encapsulated retinol’, in reality it is probably only 0.07% retinol. My advice is simply: leave products with retinol alone, unless you are sure it is fresh. Retinaldehyde only needs to be converted once before it can carry out its skin rejuvenating work. That makes it, in theory, more effective than retinol. I say ‘in theory’ because it has not been in existence for very long, and little research into this ingredient has been carried out. Two randomised studies carried out, with 229 people and 125 people respectively, found that 0.5% retinaldehyde had a comparable effect as 0.05% tretinoin and caused less irritation. Up until now little research has been carried out into its stability, but it appears to be more stable than retinol. The ingredient will, however, still be sensitive to oxidation, so it will need to be packaged in an airtight dispenser, kept cool and used soon after production. According to a study carried out, retinaldehyde is even more effective if used in combination with glycolic acid. This is also a new variation of the vitamin. Apart from the fact that we know it only needs to be converted once, there is little known about the effectiveness and stability in comparison to retinaldehyde. The only studies derive from the Korean producers themselves. Retinol retinoate is more stable than retinol. Theoretically, both ingredients are a better choice than retinol and retinyl palmitate. Hydroxypinacolone retinoate is one of the newest forms of vitamin A. It differs from the earlier talked about ingredients by its ability to attach itself directly to the receptor, and therefore, just as tretinoin, is able to carry out its work immediately. But its molecular structure makes this substance more stable and less irritating. Until now, little research has been carried out into hydroxypinacolone retinoate. You can find out much more about the efficacy of the substance by looking at medical articles into the efficacy of picolinic acid – substituted esters of 9-cis retinoic acid (which is hydroxypinacolone retinoate). In similar studies it appears that this ester speeds up wound healing and stimulates collagen build up, prevents the breaking down of elastin and collagen and reduces the forming of MMPs, and all without the irritation. 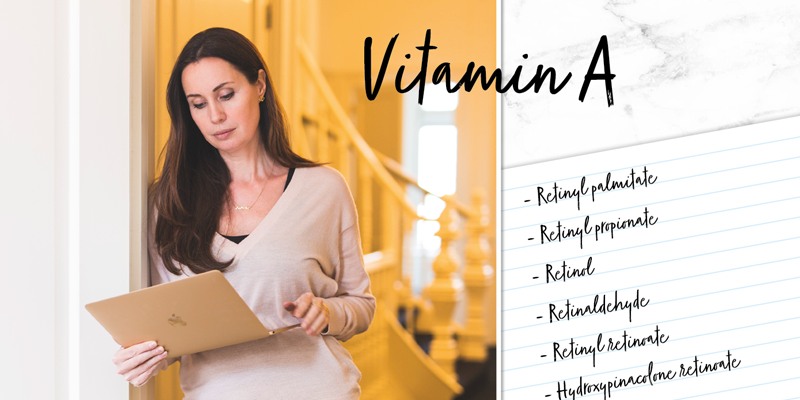 Despite the fact that hydroxypinacolone retinoate appears to be much more stable than the other forms of vitamin A, oxidation is still a problem. Finally, it is worth realising that the efficacy of vitamin A acid also depends very much on your skin. Where that is exactly, we do not know but it is sometimes just a question of trying it out. You’ll need patience, the real skin rejuvenating effect usually occurs after applying it for 4 to 6 weeks. A product with vitamin A acid should be in airtight packaging. A vitamin A acid is more stable if less water and more oil/silicones are added. Preferably not a high concentration of vegetable oil in conjunction with the risk of oxidation. Perfume is not only bad for your skin, but also influences the stability of vitamin A acid. So choose fragrance free. Choose a product which also contains soothing substances/antioxidants. The cooler the product is kept, the better it keeps.